The Belize Audubon Society was formed by a group of 55 enthusiastic and energetic conservationists on February 6, 1969, as a chapter of the Florida Audubon Society, and became an independent Society ini 1973. 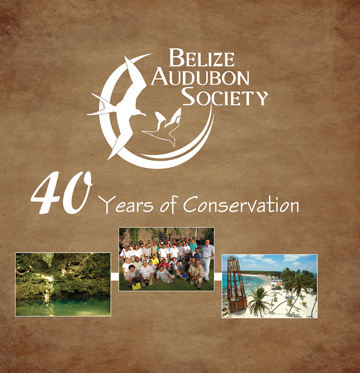 For the past forty years, the Belize Audubon Society (BAS) has made Belize a model of a developing country with an environmental consciousness. Since the very beginning the Society has sat upon the same three-legged programmatic stool, the legs of which are: Advocacy, Environmental Education and Management of Protected Areas. BAS manages nine of Belize’s public protected areas: Actun Tunichil Muknal, Blue Hole, Half Moon Caye, and Victoria Peak Natural Monuments; Cockscomb Basin and Crooked Tree Wildlife Sanctuaries; Guanacaste and St. Herman’s Blue Hole National Parks; and Tapir Mountain Nature Reserve. For 40 years, each advocacy issue, environmental education project, reseearch project, and protected area has been a story in itself, all of which are told with the colourful photographs by Dirk Francisco. BAS has accomplished all this with the help of its partners who have provided financial support and joined with us in the work of preserving Belize for a bright future. Belize’s other environmental organizations, stakeholder communities buffering BAS-managed protected areas, international and local funding agencies, volunteer organizations, and corporate sponsors have all been our partners in conservation. BAS Mission: The Belize Audubon Society is a nongovernmental membership organization dedicatd to the sustainable management of our natural resources through leadership and strategic partnerships with stake holders in order to achieve, create and maintain a balance between people and the environment.